Savonarola slipped out of his home in Ferrara without saying goodbye to his parents. The 23-year old left secretly because he feared that his family would not approve his course of action; he was throwing aside years of medical and philosophical education to join the Dominicans. Convinced of the reality of an after-life which would bring everyone either dismal doom or glorious salvation, he became morose. When he began to preach, his strong sense of right and wrong drove him to denounce the sins of the day. At first his sermons were too scholarly for the masses, but he simplified them. Large audiences heard him utter dark prophecies about the future of Italy and Florence and exclaim that the church was a prostitute. Savonarola became abbot of San Marco at Florence. His allies formed a republic. Gangs of Dominicans roamed the streets begging and enforcing a dress code. Savonarola became a gnat, buzzing in the ears of corrupt Pope Alexander VI. He denounced the pope's sins and called on Europe's leaders to throw the wicked pontiff out of office. For his part, Alexander worked to bring down the friar. But the pope could wait, for he realized that sooner or later the people would turn against Savonarola. For the time being, however, Savonarola rode high in opinion. No building could hold the thousands who came for his sermons. He called on the Florentines to burn all books, paintings, carvings and any other luxury that drew their hearts away from the deeper things of God. Florence listened. 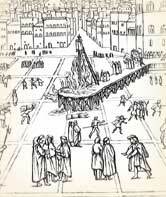 On this day, February 7, 1497, he consigned the follies of the city in a great "bonfire of the vanities." Dirty pictures, gambling tables, books and art went up in smoke. Savonarola especially loathed paintings that made the Madonna look like a whore. But in 1498, the situation changed. Although some of Savonarola's predictions came true, others failed. Bad decisions, not all Savonarola's fault, brought the city to starvation. Its money chests were empty. Alexander VI threatened an interdict which would cut off all religious functions from the people. The people of Florence turned against the preacher. A Franciscan challenged Savonarola to an ordeal by fire. Savonarola's disciple Domenico da Pescia accepted in his place. Crowds gathered. The Franciscan chickened out. Cheated of their spectacle, the crowds blamed Savonarola. The next day he was arrested. Between April 9th and May 23rd, church authorities tortured Savonarola again and again and forced him to recant. Each time, when he recovered from the torment, he took back his words--the last time with such fury that his interrogators were afraid. On May 22nd he was interrogated one last time. Seeing that he could not be moved, his interrogators sent him back to his cell in shackles and sentenced him to death. The sentence was carried out May 23rd. Savonarola and two other friars were first hung and then burned. As the reformer's body was dumped into the fire, scoffers shouted, "If you can work miracles, work one now!" His hand flew up, two fingers extended, as if blessing the crowd, which panicked and fled from the square, crushing several children to death. Kirsch, J. P. "Girolamo Savonarola." Catholic Encyclopedia. New York: Robert Appleton, 1914. Van Paassen, Pierre. A Crown of Fire; the life and times of Girolamo Savonarola. London: Hutchinson, 1961.